Texas Pepper Works Candy-Krisp Jalapeños have a nice bite that are not too hot and not too sweet. Perfect as an hors d'oeuvres over cream cheese and serve with your favorite crackers. Try Candy-Krisp Jalapeños on a sandwich, hamburger, salad, baked potato or add to your favorite tuna or chicken salad recipe, soup or serve over cheese and crackers. The possibilities are endless! Great experience. Fast shipping and reasonably priced. Exactly what I wanted. Thank you. Love your products (grandson does also)! These candy krisp jalapenos are the BEST. I've tried making them and have purchased them from other companies. No one holds a candle toyours. I have a sister who lives in Texas, who introduced me to yours. I use them to make a fabulous appetizer. Just the right balance of sweet and zingy! Loved it over cream cheese with crackers. Fantastic product! 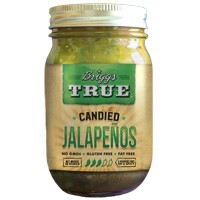 After having some homemade candied jalapenos, we searched and searched for something comparable. Perfect mix of spicy & sweet! Love the Kandy Krisp Jalapeño Peppers. My nephews love them and it's become a family tradition now at the holiday's. I serve them as an appetizer on a triscuit with veggie cream cheese and a few peppers on top. Great quality, service and product! Thank you! We have been purchasing and enjoying these peppers for years. Love them. I will keep them on hand at all times. I love the Candy Krisp Jalapenos they are the very best ever!!!! Hard to find at the stores around here any more so will just keep on ordering them! Advantages: they are great for a quick party appetizer just pour some of the Candy Krisp Jalapeno`s over philly cream cheese. It's great on crackers! EVERYONE loves my recipe! So many compliments! Disadvantages: haven't found ANY disadvantages at all! I don't usually write "fan letters" to companies but wrote right after getting the Candy Krisp Jalapenos. Got such a sweet, polite response back with even more ideas on how to use them. Now I am pretty addicted to using them on my morning eggs to any kind of lunch item. My favorite is still the pulled pork baked potato with the peppers on top, just the best balance of sweet and hot. My daughter's favorite is a single one on top of a deviled egg. Thank for such great service and yummy products.